The Chief Statistical Officer make the job easier by getting all equipment and supplies ahead of time, and laying them out in an efficient manner. Planning should be done so that office work can be accomplished without constant backtracking. Provide shelves or pigeonholes for storage of score cards, if used. Near the entry window, provide racks for all supplies that the person tending the window will need. All competitor service should be done through an entry window. 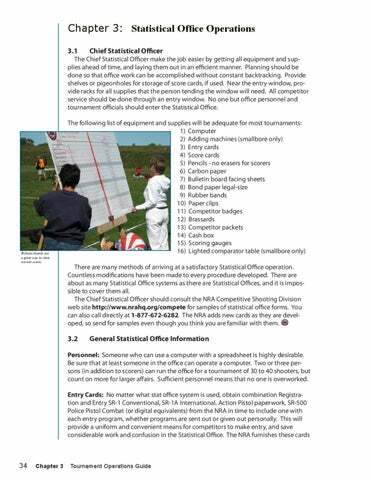 No one but office personnel and tournament officials should enter the Statistical Office. The following list of equipment and supplies will be adequate for most tournaments: 1) Computer 2) Adding machines (smallbore only) 3) Entry cards 4) Score cards 5) Pencils - no erasers for scorers 6) Carbon paper 7) Bulletin board facing sheets 8) Bond paper legal-size 9) Rubber bands 10) Paper clips 11) Competitor badges 12) Brassards 13) Competitor packets 14) Cash box 15) Scoring gauges 16) Lighted comparator table (smallbore only) There are many methods of arriving at a satisfactory Statistical Office operation. Countless modifications have been made to every procedure developed. There are about as many Statistical Office systems as there are Statistical Offices, and it is impossible to cover them all. 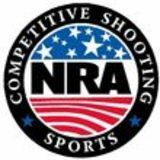 The Chief Statistical Officer should consult the NRA Competitive Shooting Division web site http://www.nrahq.org/compete for samples of statistical office forms. You can also call directly at 1-877-672-6282. The NRA adds new cards as they are developed, so send for samples even though you think you are familiar with them.